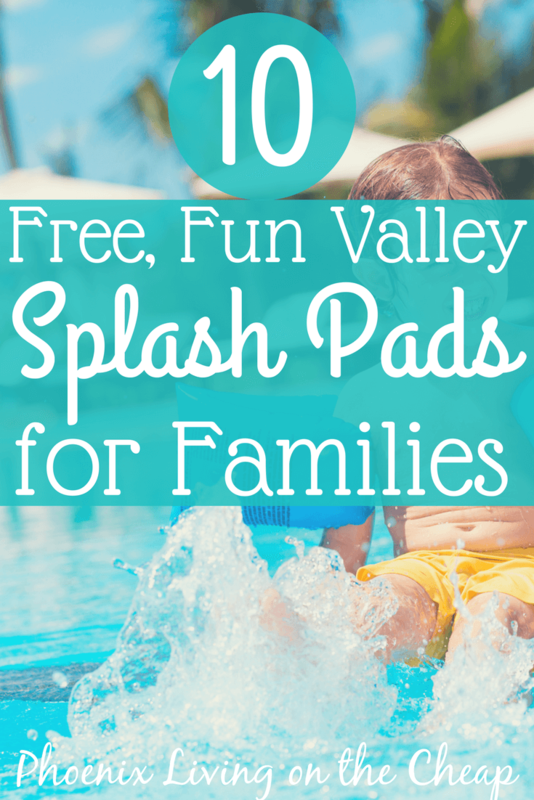 Looking for splashy places to take the kids but don’t want to pay splashy prices? These free water features and splash pads are fun for the whole family, and they won’t break the bank. The splash pad opened in May and will be open until October 1 from 10 a.m. to 7 p.m., Monday through Saturday (closed Sundays). In addition to the splash pad, Altadena also features a playground, ramada and picnic area, and grills. However, there are no public restrooms, so plan accordingly. Altadena Park is located at 3711 E. Altadena Ave.​ and the splash area is free. Edison Park, located at 901 N. 19th St. open its splash pad on May 28, and the splash pad area will be open until October 1 from 8 a.m. to 8 p.m.
Edison Park also features lighted basketball, a playground, ramada and picnic area, lighted softball field, multipurpose field, and volleyball. Recently remodeled Cortez Park’s splash pad and water area is a great way to spend a few hours, cooling off and having fun with the whole family! Located at 3434 W. Dunlap, the park also features lighted basketball, lagoon, fishing, a playground, pool, ramada and picnic area, grill, restrooms and lighted softball and volleyball. The park is open from 5:30 a.m. to 11 p.m., although the best times to go are early morning while it’s sunny yet still not too hot or crowded. The best of both worlds for families: outlet shopping and a splash pad for the kids! The splash pad at the Outlets at Anthem is now open. The splash pad will be open during operating hours: 10 a.m. to 8 p.m. Monday through Saturday and 10 a.m. to 7 p.m. on Sunday. For more information, click here. Another great way to enjoy some shops, a movie, or even a tasty ice cream treat and let the whole family play in water is the Fountain Park at Westgate. Open daily from 10 a.m. to 10 p.m., Fountain Park is across from the AMC movie theater, and is centered by an interactive fountain/splash pad. Friendship Park in Avondale recently underwent a multi-million dollar renovation, including a 1,800 square feet splash pad featuring images of desert animals. Fountain Park is a great location to spend a few hours on the weekend, as it also features walking trails, a Japanese Garden, tennis and pickleball courts, playgrounds, picnic tables and ramadas, a dog park, and restroom facilities. Friendship Park is open daily from 6 a.m. to 11 p.m. and is located at 12325 W McDowell Rd, Avondale, AZ. Located in Peoria, Pioneer Park features a circular spray pool, splash pad, plus plenty of fun for the whole family with picnic tables, a playground and a dog park. Pioneer Park is open daily from 6 a.m. to 10:30 p.m. and is located at 8755 N. 83rd Ave. in Peoria, AZ. Need to get some shopping in but want to tire the kids out first? Before visiting Target or any of the other plethora of retail stores at Desert Ridge, visit the Desert Ridge splash pad. Located near the AMC Theatres and Starbucks, chill out with Desert Ridge’s free wifi and watch the kids splash around. Open daily from 8 a.m. to 11 p.m.
Also in Desert Ridge, there is a Children’s Play Area located near Barnes and Noble and free, live music performances every Friday and Saturday night near the AMC Fountain Area. Free music starts at 7 p.m. For more information, click here. Identified as one of the Valley’s Best Splash Pads by Arizona Foothills magazine, Kierland Commons splash pad does not disappoint. The splash pad area offers shaded seating and a grassy areas, plus plenty of places for parents to grab a cold tea or ice cream. Kierland Commons is open from 10 a.m. to 9 p.m. Monday-Saturday and noon to 6 p.m. on Sunday. Located at Greenway Parkway and Scottsdale Road. Located in Tempe, Jaycee Park has a water play area with “run-through water arches, in-ground fountains and water guns.” This 7 acre park also offers plenty of fun for the whole family, as it also offers basketball courts, a dog park, grills, picnic tables and ramadas, a playground, restrooms, and volleyball courts. The park is open daily from 10 a.m. to 7 p.m.
Did we miss any fun, free splash pads or water features? Let us know in the comments!